Last week I began a series of posts about Moro masks from the State of Mexico, the state that surrounds Mexico City. I had a pair of masks from about 1970, and miraculously, I found a Youtube™ video demonstrating that such masks were still in use in their traditional setting, nearly 50 years later. Today we will examine other Moro masks from that era. Today’s trio of Moro masks all appear to be by the same hand. They are of three different sizes and the middle sized one seems less worn, while the other two could easily date to the 1940s. Despite their differences in size, they confirm one another as representatives of a type. I bought all three from René Bustamante, two, in August of 1993, which were found in Atlacomulco, and the third, from Agua Fria, in April of 1994. Such masks do not appear in recent video performances from either town. I discovered a fourth example in this style in a valuable reference book—Museo Nacional de la Máscara: Catálogo— a catalogue of the masks in the collection of Victor Moya Rubio (no date, page 108, plate 371). This near duplicate was said to be from San Pedro del Limón, State of Mexico. That town is about 150 miles south of Atlacomulco; these masks really travel! A Youtube video of the Moros y Cristianos of Limón in 2015 shows a variety of Moro dancers, some withe Lunar headdresses, some with conical headdresses, and others with crowns. Their masks are larger than today’s trio, with very large noses. And here is yet another example of this type, from Pinterest™. Here is the largest, complete with a helmet made of galvanized tin that René Bustamante supplied as appropriate for this mask; I believe that the mask was collected without any headdress. In el Estado de Mexico (the State of Mexico, the state with Mexico City at its center), the Christians are often led by a Santiago figure wearing a wooden horse or part of one at waist level, similar to what we find in the Santiagueros dance. A notable difference is that the Santiaguero dancers often wear masks, while their Christian counterparts often wear costumes without masks. Santiago himself seldom wears a mask in either dance. Today we will begin with Moro masks used in the Moros y Cristianos dance from San Pablo Tejalpa, a town in the Municipio of Zumpahuacán, in el Estado de Mexico. There is a good dance photo of these dancers in Moya Rubio’s book, Máscaras: la otra cara de méxico/ Masks: The Other Face of Mexico, third (bilingual) edition (1986, p. 105) and another of the mask and headdress worn by the Moro dancers, this one with an articulated jaw (p.106). That author took those undated photos in San Felipe Tejalpa, which is evidently a very small town near San Pablo; I can’t find it on a map. However in the text (p.121), Moya Rubio stated that these masks were from San Pablo Tejalpa. I bought this first mask and headdress from René Bustamante in 1994. It was said to be from San Augustin, Estado de Mexico, but I believe it was actually made in San Pablo Tejalpa. It probably dates to the 1970s. 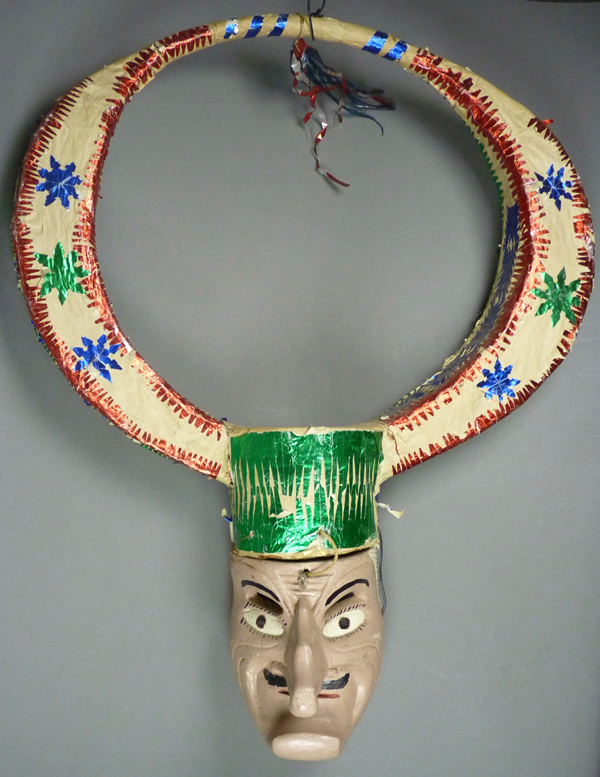 The “lunar” headdress, made of paper mache over a reed frame, is a symbolic representation of the new moon, a Moorish image. In Donald Cordry’s book—Mexican Masks (1980, page 26, figure 29)—we see nine Carnival masks from the Mexican State of Tlaxcala, three of leather, while the other six were finely carved from wood. The dance figure who wears such a mask is often referred to as a Catrin, a word that means “dandy.” The wearer(s) can also be called a Paragüero (umbrella holder) or a Cuadrilla (gang or crew). Under such names the wearers of these masks dance during Carnaval. Three of the wooden masks in Figure 29 had eyelids that could be opened or shut by the dancer pulling a string. On page 104, plate 147 of Cordry’s book, we find a photo of Carlos Reyes Acoltzi, of Tlatempan, Tlaxcala, with two of his sons, taken in 1971. The caption for that image states that Carlos was a santero, a carver of saints, and a mascarero as well (mask carver). Carlos had carved four of the wooden masks shown in figure 29, including the three with mechanical eyelids. The religious orders in Mexico, such as the Dominicans, the Augustinians, and the Jesuits, trained Indians in their congregations to be the artisans and craftsmen. Thus Indians were taught to create the wooden statues portraying God, Angels, Devils, and the European Christian saints for display in their churches. It was natural for these santeros to become the makers of dance masks used in religious fiestas, and for those carvers to create masks with the beautiful faces of the saints or the dreadful faces of the Diablos. 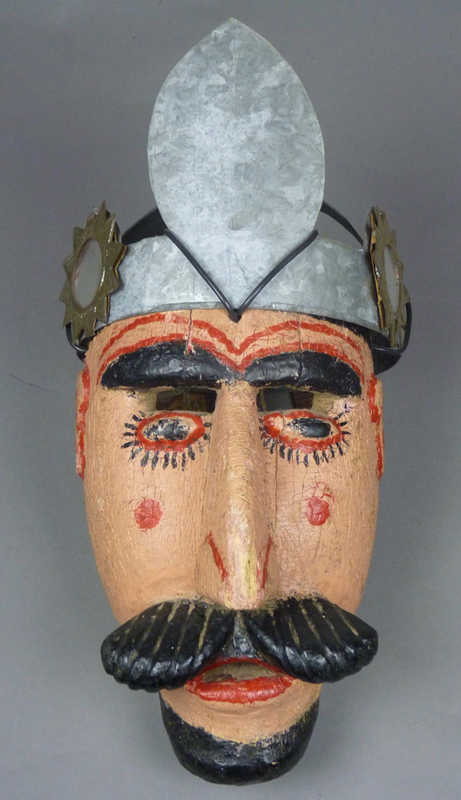 This practice continues to the present day, and I provided several examples of Santeros who were also mask makers in my book—Mexican Masks and Puppets: Master Carvers of the Sierra de Puebla. 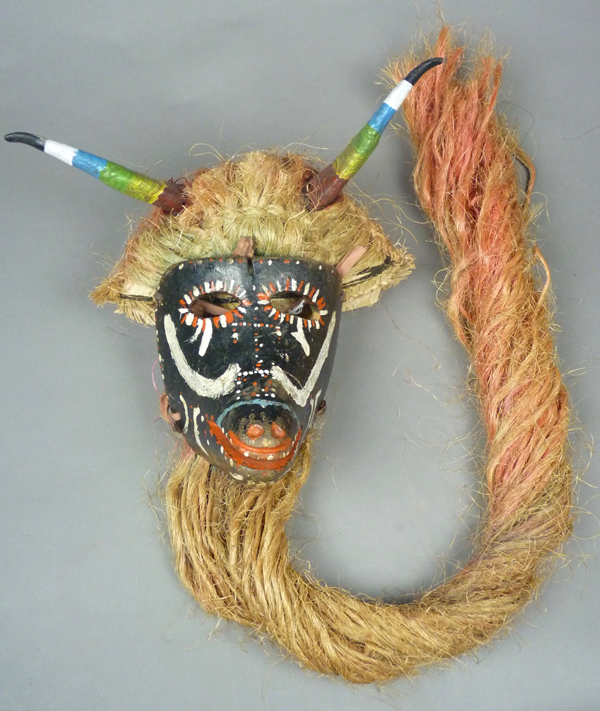 Today we will look at six of these beautiful Catrin masks. I will begin with a pair that appeared in my post of August 18, 2014, to illustrate the level of quality of the traditional masks in Cordry’s book (in contrast to other masks there that were invented, falsely labeled, and therefor “decorative”). 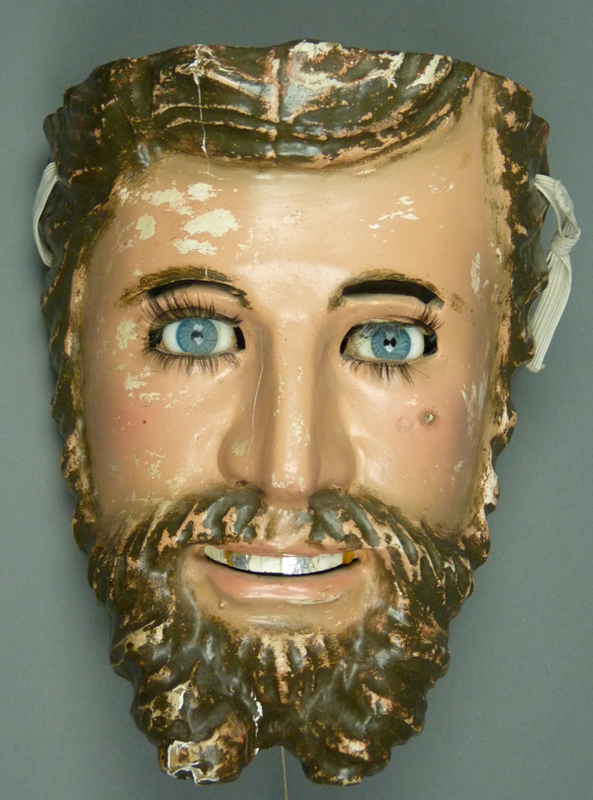 I had purchased these masks from Robin and Barbara Cleaver in 2000. They believed that the two were carved in the 1930s or 1940s, and that their doll’s eye movements had been imported from Germany in the 1930s. These Catrin masks have the beautiful faces of saints. The paint on the face of this mask is obviously worn. If the string that hangs under the beard is pulled, then the eyelids will close.